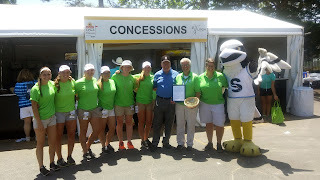 Galloway Township, NJ – Stockton University’s softball team honored the late Tara Jean Barker, a former star athlete and student, by donating $800 in tips raised at concession stands during the ShopRite LPGA Classic tournament, held May 29-31 at the Stockton Seaview Hotel and Golf Club, to the Tara Jean Barker Memorial Scholarship endowment. Barker, a two-time Stockton graduate who earned a Biology degree (2006) and a Doctor of Physical Therapy (2008), was the first softball player to be inducted into the university’s Athletics Hall of Fame in 2013, which is the year she lost her 17-month battle with cancer. Her parents, Greg and Beverly Barker, established a memorial scholarship endowment through the Stockton University Foundation in their daughter’s name. Barker worked as a student athletic trainer in high school and continued that tradition for six years at Stockton. After finding work as a physical therapist, she returned to Stockton every year to participate in job fairs and career days to promote Stockton’s physical therapy program. The Tara Barker Memorial Scholarship was awarded this past academic year and was recently awarded for next academic year. Excellent post. always great to find good honest practical content. Thank you so much.